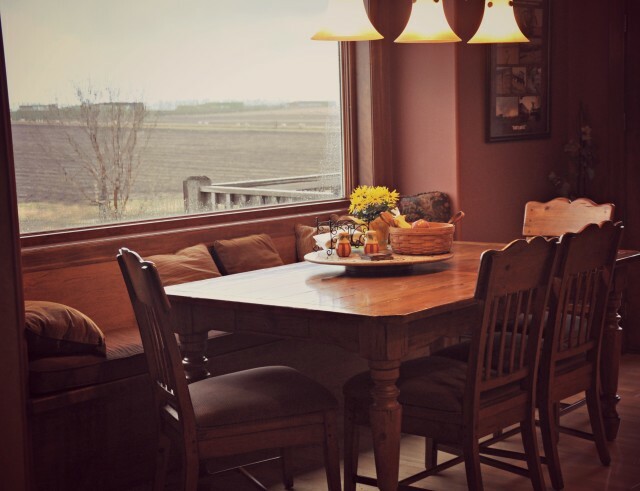 We bought our kitchen table the year we moved back to the farm. It was a pine rectangle with square pegs and sturdy legs. The saleswoman told us that the craftsmen pounded the wood with chains and ball-peen hammers to give the table its distressed finish. We paid dearly to have a kitchen table that looked older than it really was. This was the most expensive piece of furniture we’d ever bought. I protected the table so fiercely, you might think it had once served duty in the Upper Room. The delivery men brought the table to the farm a few days after Thanksgiving that year. But even if it had been arrived in time for the holiday, I wonder if I would have let the fork-wielding toddlers eat from it. After all, this table had been beaten to distressed perfection. And this was as well-worn as I wanted it to look. Ever. I remember wincing when my mom, sitting at the table’s edge, wrote a grocery list on a scrap of paper. Her pencil engraved curvy letters into the pine, a wood that yields easily to pressure. Eight years later, I can hardly find her carving. That’s because the entire table is covered in criss-crossed etchings. Our table looks like a Colorado road map. About a year after our big purchase, I gave up the urge to stand guard. Maybe it’s because I had no choice but to surrender to this truth: We bought the table because, well, we actually needed a place to eat. And I suppose I also realized that we live on a farm, not in the Louvre. Somewhere along the way, I fell in love with a bruised table that earned its wounds the old-fashioned way. I came to appreciate the table for what it was becoming: a storyteller. Our kitchen table carries a long-term memory all its own. When mid-morning sunlight slants through the picture window, I see our stories engraved in nicks, scrapes and curves of letters. I run a forefinger along a deep, thick scratch — a 10-inch-long souvenir from a visiting missionary and her errant laptop. I pull back the chair where my husband sits at supper, and I see long, deep grooves in the slatted back. I laugh and wonder: Does he keep drill bits in his pockets? I find childlike script, harried scribbles, last night’s bread crumbs between the cracks. I touch a grandfather’s checkmarks. He’s been gone five years now. Last night, I dropped the church’s laptop on the table. 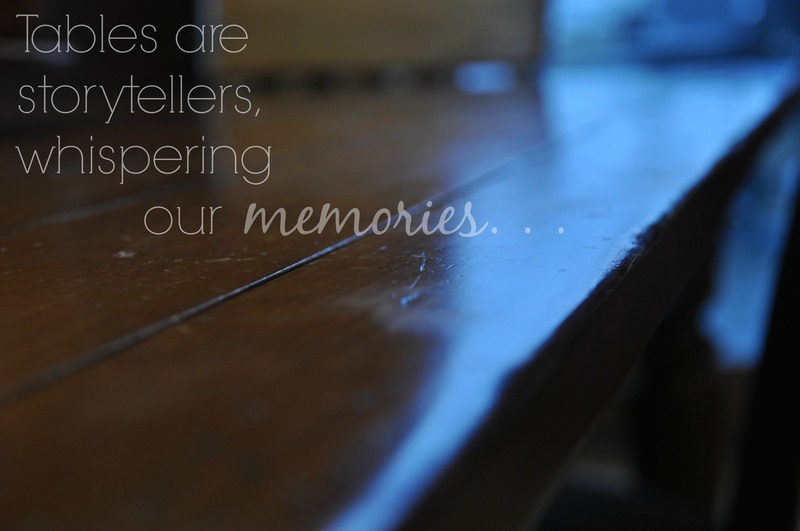 It fell hard, leaving a deep imprint in our table – and another memory in a wooden diary. And this time, I didn’t wince.
. I’m republishing the essay today, in celebration of her book’s release. You hear me preaching, “preapproved, preapproved” here. Well, believe me. 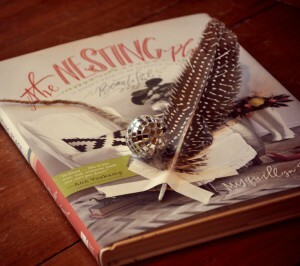 This is the home-decorating book for us, the #preapproved. Link below! For details on the #TellHisStory linkup, click here. Share the love of story by visiting someone else in the community! How did I miss this beautiful gem the first time around – so glad for the reposting today, Jennifer. I can totally relate to the over-protection of the dining room table. My in-laws bought ours as a gift – it was expensive — and I bought a table topper to lay over the wood finish. Man that thing was hideous! I finally came to my senses. Why have a beautiful table if you hide it with a hideous plastic topper? I know those plastic toppers! Yes! I was determined NOT to have one, but also not to get the table banged up. It looks pretty rough, to be quite honest, but always pretty loved. This essay ran at The High Calling in 2010. I remembered it today when I was writing a review of The Nester’s book. Have you read Nesting Place? So good, Michelle. Love how you bring out the emotion in this story and make me as a reader relate to it as if it were my own story. Beautiful, a good start to a beautiful morning here in Durban! Beth, Can you see, in the comment box, how to add a picture? Down there in the lefthand corner of the comment box? If you have a picture of your table handy, upload it for us, into the comments. I thought I’d come back and share a picture. You can’t really tell how the chairs are cracked in several places or how my husband had the desire to refinish the table one day and began sanding it down but never finished. 🙂 We’ve had this same table since we moved into our home (about 15 years ago). Usually it’s full of my son’s school books but it was maid day today so this was captured after some clean-up. Lots of memories made and shared around this table. Blessings. Thanks for hosting! I love the story! We just moved, and I have a wood table that has been used for just about everything. But, I decided not to get a new table because I can enjoy the grandkids, let them do projects and not worry about the table. Plus, I have the memories I can tell them about doing projects with their mom at the same table. That’s great thinking, Debbie. Can you see, in the comment box, how to add a picture? Down there in the lefthand corner of the comment box? If you have a picture of your table handy, upload it for us, into the comments. Loved this post, Jennifer! How often have I squelched a moment for fear of a possession being harmed! Rather than seeing each of these material blessings as God intended…so that I would use them to bless others, love openly, encourage connection, make memories. That’s being a better steward of those blessings than wrapping them in protective plastic ever would be! So well stated, Holly. Thank you. 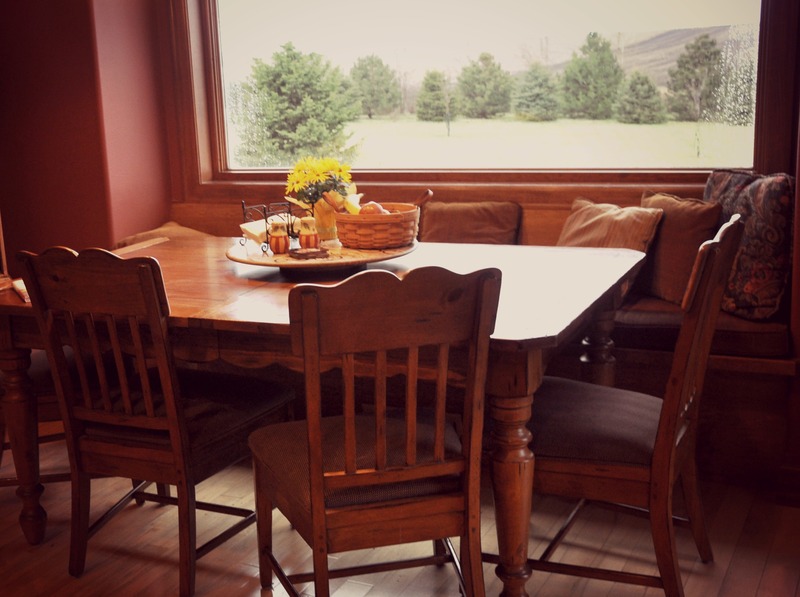 Do you think that your old table will fit in your new place? … Or maybe one of your kids would want it, to keep it in the family? I’m such a sucker for family tradition, family heirlooms, etc. Can you see, in the comment box, how to add a picture? Down there in the lefthand corner of the comment box? If you have a picture of your table handy, upload it for us, into the comments. This is absolutely beautiful and so heartfelt, as always, Jennifer. Your view from the table is amazing. I think I would sit there all day. “Tables are storytellers, whispering our memories” took my breath away. I will keep that in my heart the next time my dining room table is being used. Thank you! It’s a great view. That field out back is our north field. Scott will be planting it soon, once the rain stops. Many mornings, I can see deer down in the waterway. And often, we see pheasants. … When we moved back here to the farm in 2002, we had to build a new house. Scott’s parents already lived in the original farmhouse, and his grandparents lived in a 1970s ranch-style home over on the original farm yard. We live near the Lee fields north and west of his folks’ place, about three miles away. It’s a beautiful view up here. Our house is just up on a crest of a small hill, and we didn’t realize how far we could see until after the house had been framed up. I’ll never tire of the view. Oh yes, Jennifer. I, too, love the stories our tables weave, not only by the markings on them but around them. If they could only talk, they know a lot: the fights and reconciliations, the jokes and the laughters… Our tables are very like us – scratched, stained, nicked – but loved nevertheless. Great point, Rina. Thanks for sharing. I’m so glad you shared this story again Jennifer. It’s a beautiful and touching story reflecting the instinctual desire to control our environment facing the transformation to a grace filled-living, even when it comes to our precious stuff. His precious memories engraved over the years. Its beautiful. Thank you, Jolene. I had published this years ago, over at The High Calling, and it came to mind again as I was finishing up The Nester’s wonderful new book. I’m not the kind of person to pick up a book on decorating, but this book is simply outstanding. It’s got great tips and advice for decorating, but mostly for just living in and loving on the house we already have — imperfections and all. At the auction, it was alone by the wall of the old home. It’s legs had been removed and they were laying against its top, which was covered by layers of ugly old varnish. When it came time to bid on it, no one raised their hand – except me. I bought it for $2. I bought it at a time in our financial life when $2 was much like $2000. It wouldn’t fit into the car, so I had to go home and get my Curt and our truck. He wasn’t impressed with my “bargain”, knowing our finances and how often my “bargains” entailed work from him. He kept his thoughts to himself as we loaded it into the truck and took it home. I put the legs back on by myself. The table wobbled. I tightened them and the wobble lessened. There were many moments, while sitting at the table, I would pick at the old varnish, thinking I needed to take the time and do it proper. It took the help of others to make needed changes. Upon closer inspection, Curt discovered I had put the legs on backwards. No more wobble. My mom, newly retired with time on her hands, took the table and upon its return it had transformed from ugly to beautiful. Each time I am reminded of my “self” when I look or sit at this $2 table. At the auction, my ABBA is the only one who raised His Hand. He bought me at the price of His Son. He placed me in His Church, my new Home. It has taken the help of Him, His Son, The Holy Spirit, His Word, His Family, in the work of transforming my “self”. He has taken the “ugly” and transformed it into “beautiful”. LOVE your story, Deby. Thanks for sharing. I have no particular feelings about my table, but my beautiful piano has a history! The cat that jumped on top of it and knocked framed photos onto the lid… the missionary’s kids who ran metal Matchbox cars over it… the guests who put their wet glasses down on it. Maybe some day I’ll feel better about it. Not yet, though! Loved reading about your kitchen table Jennifer. This line “somewhere along the way, I fell in love with a bruised table that earned its wounds the old-fashioned way. I came to appreciate the table for what it was becoming: a storyteller.” Each notch and groove tells a story. You’ve got a lifetime of love in your kitchen lady. Just listen. Blessings. This sounds like my table. We bought it after our daughter’s were grown but pre-grandkids. The grand babies have left their mark, and that’s ok with me. What a wonderful post and thought! I often think of the many meals that have been served from our kitchen table…family gatherings, birthdays, Easter dinners, Thanksgiving Days, and, of course, Christmases. Oh, the stories it could tell! My dear Mom and Dad have now passed away, along with other loved ones who used to gather here with us…but the sweet memories remain forever close to our hearts. Thank you for the beautiful story. So touching! I loved this post, Jennifer. I have a similar story regarding my own kitchen table. Not two months into having it, someone put a lovely, wobbly 6″ scratch in it, and then my daughter spilled nail polish on it! I was instantly reminded that we must not put our confidence in the ‘things’ we own, no matter how lovely they are. It’s like that first scratch in a new automobile. Drives us crazy. 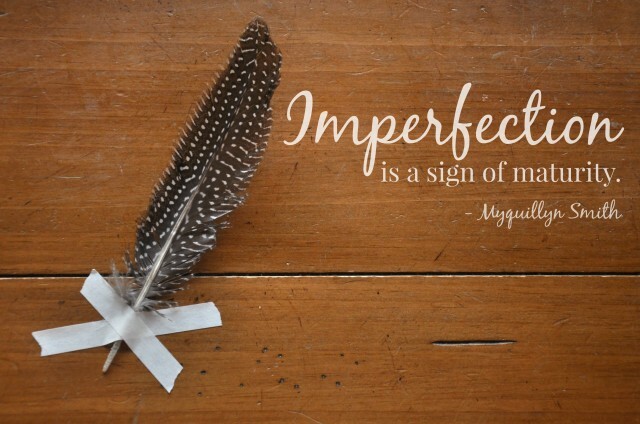 Your table may have come perfectly “distressed”….but now it has “CHARACTER”! And all those wonderful stories & memories, yes? I am so glad you shared the story again, Jennifer, as it was a first for me! I am wondering how it has taken me so long to discover the internet! Seriously, five years ago, I had not heard of so many of you! But I do not want to digress. This story so resonated with me as we have a pine wood coffee table in our family room, also our most expensive purchase in years. I have been thinking about sanding it down & refinishing it. I sit, tears running at the moment, as it has never looked more beautiful than this very minute. Beautiful post! Oh, how many things did I try to keep perfect? How many do I still? It’s exhausting. I did one wise thing, though. I got my mom’s old worn, white-tiled kitchen table from her and told my kids this was the one place they could not be so concerned about keeping things clean. There is acrylic paint, nail polish, glue…that will never come off. And that’s okay, because as you have told me today, the table is a storyteller. Oh, I’m glad I’m not the only one who has winced when someone engraved writing onto a table. ha. I’m getting better about letting it go, but I still notice. May I learn to do as you though and view my table as a storyteller! Love this, Jennifer. Your story about your table makes me smile and laugh as I have the same story. There are few new and pretty things in our house and when I finally got the new table, distressed like yours, I was a bit manic about it. So much so that a friend would always ask before she sat down with coffee. That was a wake up call to the crazy I was portraying over the table, but I still find myself wincing a bit when something spills but for His grace I can smile and laugh, too! 🙂 Loved this story today, Jennifer. Thank you! Not long ago, I was at my parents’ house visiting for the weekend. They’re downsizing in coming days. My daddy asked me a question that has stayed with me in these last days. “Elaine, what pieces of furniture would you like?” My answer was immediate because I’ve been thinking on this question long before he ever asked me. I imagine I’ve been thinking on it for years. I want the rocker; it was the first piece of furniture that my parents bought after they were married. Like you, they paid a high price for this well-made piece of history. It’s worn and creaky now, but there are stories embedded in its wood. I know I can’t take it with me “when I go”, but I think it has a few stories left to tell, and I wouldn’t mind lending my heart and voice to its history. Beautiful words to think on.